None of the credit card offers tracked by this survey changed in the first half of July, a degree of stability which was out of step with a backdrop of generally rising interest rates. For example, Treasury bond yields, which began rising at the beginning of May, continued their rise in early July. In contrast, only some of the credit card categories tracked by this survey have seen rates rise since the beginning of May -- and not nearly to the degree that Treasury yields have increased. The primary impetus behind rising interest rates has been increased optimism over the economy. The latest evidence of improved growth, and one which caused a new spike upward in bond yields, was the employment report for June, released on July 5. In this report, the Bureau of Labor Statistics estimated that 195,000 new jobs were created in June, which is above the average for the prior twelve months. In addition, job creation estimates for April and May were revised sharply upward, making them both above-average months as well. Between increased demand for credit and the possibility of reduced Federal Reserve intervention, the bond market views a strengthening economy as a signal to push interest rates higher. Credit card companies have an additional consideration -- an improving economy helps reduce credit risk. This may help to account for why credit card companies have been slower to raise rates than Treasury bond traders. However, if market interest rates continue to rise, there is only so much of a cushion an improved credit outlook can provide before higher rates creep into the credit card market as well. Consumer credit card rates were unchanged in both the rewards and non-rewards categories. The spread between the average rate for the two categories remained at 2.43 percent, which represents the potential price consumers would pay for rewards programs if they are assessed interest. The average student credit card rate remained unchanged. Credit card offers in this category have not changed since late February. Both business non-rewards credit card rates and business rewards credit card rates remained unchanged for the fifth consecutive survey. Business decision-makers often welcome that kind of stability -- it allows them to make a decision on something like credit card choices, and then let it stand without much further attention while they attend to the core strategy of the business. 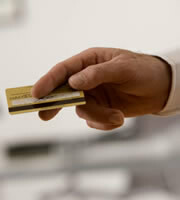 Besides reviewing credit card rates, businesses may also wish to consider their rewards programs. Those companies which regularly pay their card balances in full can get the benefits of those programs without paying the additional interest cost. The decision then becomes one of how to best reap those benefits -- whether in the form of cash back to the company, or as an incentive program for employees. The price for having a less-than-perfect credit record continued to be 4.09 percent. This represents the spread between the lowest tier of credit card rates, which are the rates charged to customers with excellent credit, and the overall average of all tiers of credit. Remember though, this price does not have to apply to all customers - those who regularly pay off their credit balances every month will avoid paying interest, and in time that regular payment habit should also help improve their credit records. 0 Responses to "Credit cards hold steady while other rates rise"